During the holy weeks before the Jewish High Holy Days, it is a tradition to pay respect at the graveside of loved ones while gaining strength through communal prayer. This is known as Kever Avot (“graves of the fathers”) and a significant part of the service that accompanies these graveside visits is the blowing of the Shofar (ram’s horn). In 2004, Cantor Joseph Gole commissioned a musical setting of the Shofar Blessings for a trio of French horns and a Shofar to be used for the Kever Avot service that year. There are three types of blasts played by the shofar in a call and response: Tekiah (one long, unbroken sound), Shevarim (three medium, broken sounds) and Teruah (short quick sounds). The sound of the Shofar is a very distinct and earthy one, conjuring images and emotions that stretch over centuries of bygone generations. When Manuel Alberto Aybar recently requested that Richman create an orchestral work with which to begin a concert honoring those who lost their lives or were injured in the terrorist assault on the Inland Regional Center in San Bernadino, California, his first instinct was to adapt the haunting sound of the Shofar into an elegy for orchestra. 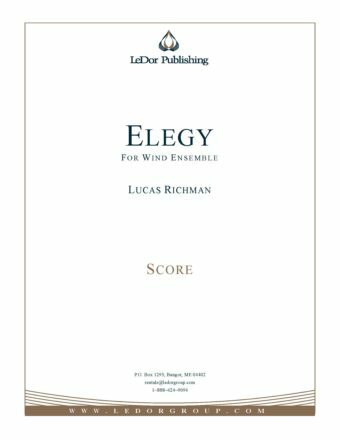 The resultant work, Elegy utilizes Richman’s original musical setting of the Shofar Blessings as bookends to the actual call and response of the Shofar, as rendered by the horn section. The Shofar Blessings are first introduced by the woodwinds and subsequently played in a varied setting for strings. It is in the middle of the work that one hears the call and response of the Shofar, interceded by muted strings in a second variation. Here we find 14 notes articulated in the Violin I part, representing the 14 people killed in the terrorist events of December 1, 2016, with the violin melody arranged in such a way that it is interrupted and, ultimately, incomplete. When the sounding of the Shofar is complete, the orchestra plays one more version of the Blessings, followed by the final blast of the Shofar, traditionally held as the longest note of all (Tekia Gedola).